Drug and alcohol cravings are a normal part of recovery. The best way to deal with them is to learn to not only recognize them, but to use new coping skills to overcome them. If you are concerned about a possible relapse, seek addiction treatment immediately. You may have alcohol or drug cravings for months or even years after you quit using. Sometimes these cravings disappear after a few minutes. Other times, they persist and can lead to relapse if not properly managed. The specific characteristics of cravings and the treatment for them can vary based on the drug. Below you’ll find links to pages with more information about cravings for specific drugs. Preoccupying thoughts about the substance. A desire to return to old using environments or see old using friends. Wanting to use drugs or alcohol when in the presence of them or near something that reminds you of them. Different treatments are available to help curb cravings and prevent relapse. Don’t be afraid to ask for help if you have strong urges to return to your drug-using habits. Each form of cravings treatment has pros and cons. It all depends on what best suits your unique needs. Cognitive behavioral therapy works to improve negative thoughts to positively influence feelings and behaviors. Therapists teach you different coping skills to be used when you experience cravings or are in the presence of triggers. Self-talk: Encourage yourself and remind yourself how far you’ve come in recovering from addiction. Avoid trigger situations: Sometimes the best way to battle cravings is to figure out ways to stay away from trigger environments and people, such as old using friends or old using locations. Relaxation: Use guided imagery, count backwards from 10 to 1, or take slow, deep breaths when experiencing cravings. Talk it out: Many recovered addicts find that cravings lose their power when they discuss them with a family member, friend or sponsor from a 12-step program. Distraction: Engage in a sober activity that will take your mind off of your substance cravings. Try a hobby or form of exercise that you enjoy, or hang out with sober loved ones. These fellowship programs – such as Alcoholics Anonymous, Narcotics Anonymous, Cocaine Anonymous and Heroin Anonymous – are free to join. The only requirement is that you wish to quit using. Many people attend 12-step meetings for life to curb cravings, to receive positive encouragement and support, and to connect with others with similar experiences. Typically, members of these programs have sponsors – people they can confide in. If you are experiencing substance cravings, calling your sponsor to talk it out can be helpful in avoiding relapse. If you are experiencing very strong and persistent cravings, you may want to enter an inpatient treatment program in which you can reside at the facility and escape from the tempting environment. You’ll receive individual therapy, group counseling, medical treatment (if necessary) and aftercare planning. If you are seeking cravings treatment but can’t neglect your responsibilities at home, work, or school, then an outpatient recovery center may be best. You can live at home while receiving treatment to prevent relapse and overcome cravings. 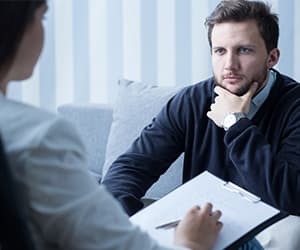 Individual therapy or counseling involves meeting one-on-one with a therapist to uncover the underlying reasons for your addiction and develop healthy coping skills. A certified mental health professional facilitates group counseling sessions in which people share their experiences related to drug addiction, cravings and relapse. Some recovery programs provide medications to help manage cravings. Recovery programs will sometimes provide medication to help manage cravings and prevent relapse, if necessary. Some medications are listed below. Meditation. Meditation and mindfulness can help to alleviate stress associated with alcohol and drug cravings and prevent relapse. Diet. Often, substance addiction leads to a poor diet and health problems. Improve your diet and eat healthy, balanced meals to provide your body with the appropriate nutrients. Who Answers? to speak to a treatment support specialist about recovery programs. Alcohol or drug cravings that aren’t managed properly can lead to relapse. In order to prevent relapse, you must be able to identity major warning signs and have a plan to deal with them. The dismantling of social relationships. Call or meet with your sponsor if you’re a member of a 12-step program, confide in a group of sober and supportive friends or discuss your concerns with your therapist. Believing that you can use alcohol or drugs without falling back into addiction. Remind yourself that recovery is a lifelong process and compulsion is a normal part of the process. Use positive self-talk or distraction strategies learned while receiving cognitive behavioral therapy. Romanticizing your past substance abuse. Make a list or inventory of all the things you enjoy about your healthy, sober life. This will put things into perspective. Sudden loss of interest in hobbies or recreational activities. Make a list of your favorite hobbies and begin scheduling times to do them. It may be difficult to get started. But over time you will likely find joy in these activities again. Sudden changes in behavior and attitude toward recovery. Don’t ignore negative and uncomfortable emotions. Use coping self-talk or meditation to promote a peace of mind. Beginning to reconnect with old using friends. Avoid using environments and schedule sober activities with a group of non-using friends. Join a 12-step program or SMART Recovery to find a supportive and sober group of friends. There isn’t one answer as to how long your alcohol or drug cravings will last. Typically, cravings will decrease over time. But they can persist for years. Whether you tapered off the substance or not. Returning to old using environment. Being around the substance or paraphernalia. If you’re looking for cravings information about a specific substance, see the craving symptoms and treatment section at the top of the page for more details. If you or a loved one is having difficulty managing cravings or needs help overcoming an addiction, call one of our recovery support specialists anytime at 1-888-319-2606 Who Answers? .
. Cully, J.A., & Teten, A.L. (2008). A Therapist’s Guide to Brief Cognitive Behavioral Therapy. Department of Veterans Affairs South Central MIRECC, Houston.